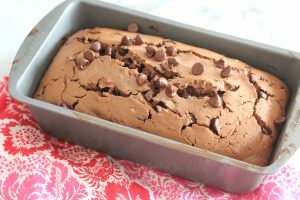 THIS POST CONTAINS AFFILIATE LINKS, MEANING IF YOU CLICK ON A LINK AND BUY SOMETHING I MAY RECEIVE A SMALL PERCENTAGE OF THE SALE AT NO ADDITIONAL COST TO YOU. The new year always means a new planner for me. I am a bit planner obsessed and typically go through two or three planners each year trying to find the one with the right type of calendar/organizer/agenda with a decent size note taking section, plus it had to have high quality paper. The colors have to be right and the size needs to fit in my purse/diaper bag/work bag but still be big enough to write in. So I decided to try something different than a traditional planner this year. I had seen a lot of pretty pictures on Pinterest of bullet journals that people had created. 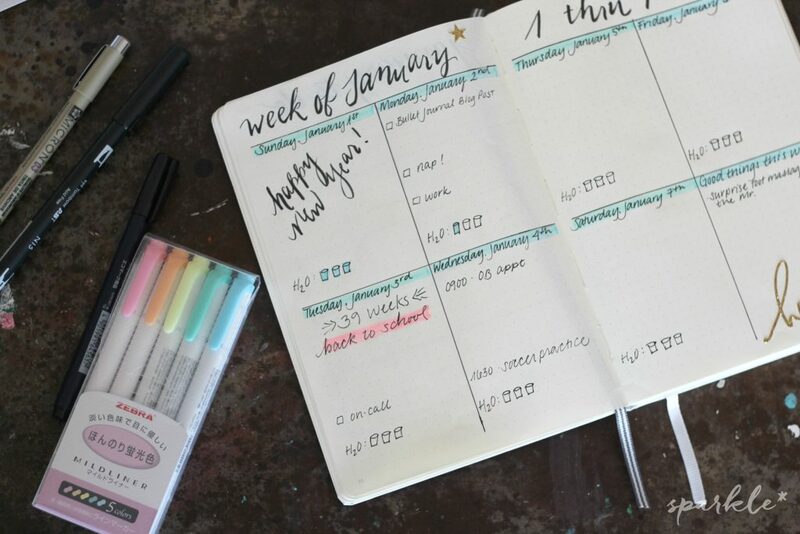 It looks like a little bit (a lot) of work and effort, but in the end the bullet journal enables you to find your own system that works for you. After much deliberation, I chose to purchase the Leuchtturm 1917. I like it because it is hardcover, has an index, the paper is dotted instead of lines or a grid and I wanted it to be white. It is the medium size, which is 5.75 x 8.25 inches, which, honestly, I’d prefer a little larger, but it should do. It has 250 pages, which I will hopefully fill up with plans, goals and inspirational goodness. An alternative journal I looked into is this journal from code&quill is a bit larger than the Leuchtturm 1917. It is 7.5 x 10 inches and has a dot grid and it is made with a lay flat design, which would make it so much easier to create layouts. But I really want a white cover, so I will stick with what I’ve got for now. The Pen – The pen I use predominantly is the Pigma Micron line of pens. I find the Micron 03 is the perfect nib size (0.35mm) for my handwriting. For drawing lines, I like the Micron 05, which has more of a medium point. The Micron pens come in more colors than black, but I haven’t tried them out, so I can’t tell you if they are amazing or not. The Pencil and Eraser – I am less particular about the pencil I use to sketch my layouts with than I am my pen. I used my kids Ticonderoga pencils from school, since they prefer mechanical pencils anyway. Really, most pencils will do. I don’t like using mechanical pencils because the point is too sharp and leaves an indentation in the paper when you erase. The pencil needs to be something that is easily erasable. I like this Pentel Hi-Polymer Block Eraser. It erases cleanly and doesn’t seem to smudge. The Ruler – Straight lines are important to me and I’ve been using a little 6 inch metal ruler that I found in my grandmother’s sewing kit. It packs away perfectly in my pencil bag and takes up so little space. This one on Amazon comes with a 12 inch ruler as well. One for home, one to go. The Extras – Here are some things you don’t really need, but are fun and will add color and personality to your pages. Midliner Highlighters – I love these highlighters! They are more muted than your typical neon highlighters. I don’t find that they bleed through the pages and the colors are fantastic. I have this pastel 5 color set but am definitely thinking of upgrading to this 15 color set once I used the other ones up. 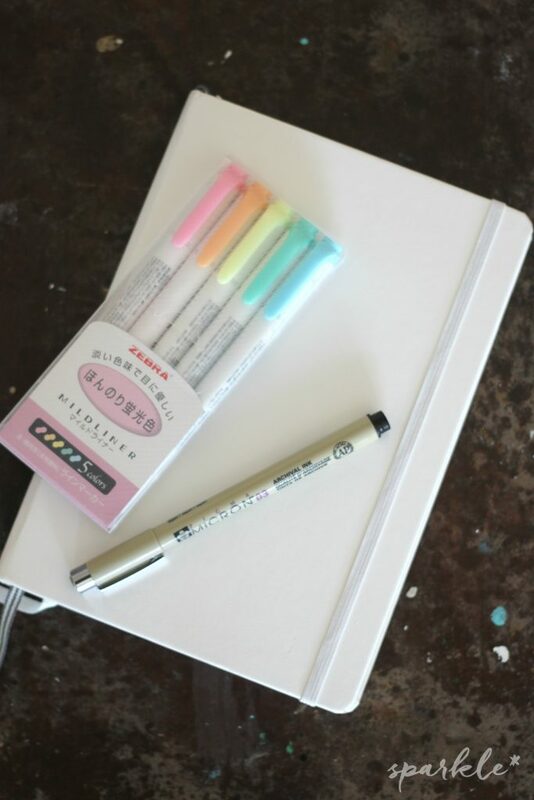 Tombow Dual Brush Pens – These are my favorite pens to use to add color to projects. One end is a brush pen, which is awesome if you are into brush lettering or calligraphy; and the other end is a pointed tip, perfect for drawing or adding detail. There are a variety of color packs to choose from, and if you are super into using them then you can invest in the 96 color pack with desk stand. I’m not quite there yet, but seriously! 96 colors! Washi tape and stickers – Of course I would add washi tape and stickers to my bullet journal. 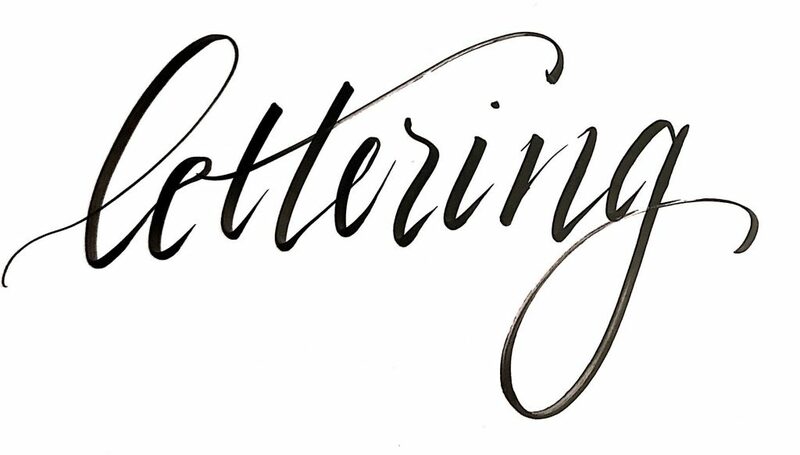 I’m no artist, and although I dabble in calligraphy and brush lettering, I can’t draw if my life depended on it. I’m crushing on these cactus stickers I found on Etsy. Washi tape is awesome, because it’s easy to remove and reapply, plus there are so many different designs to really coordinate your colors if you want. Page tabs – If you are the kind of person who needs to flip quickly to a certain page, or like your calendar months tabbed, then you need to add some page tabs or flags. Of course you can use washi tape too! Pouch – I like to have a pouch to carry my pens, pencils, highlighters, eraser and ruler in. It keeps everything together and is easy throw into my work bag or purse when I’m on the go. I found a small cosmetic bag is a little larger than a traditional pencil pouch and works amazing! 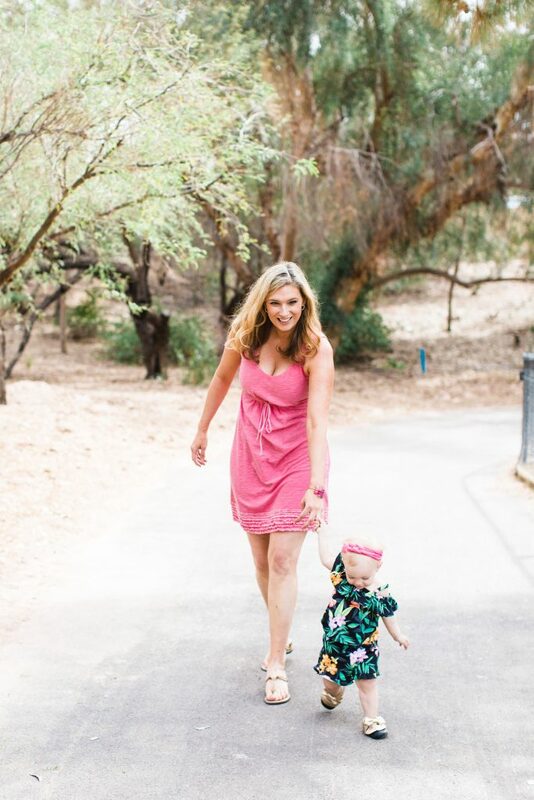 Once again with the cactuses…this one on Etsy is adorable! For me, the most important thing I need is a monthly calendar and weekly schedule. I like to see a month at a time to have an idea of what the heck is going on. I try to work the same shifts every week, but sometimes that changes. Additionally, all my family members have busy schedules too, and I need to be on top of that. Another thing that I need to be able to keep track of is my blog posts, social media scheduling and ideas. I like how easy it is to keep track of how many liters of water I drank and good things that happened during the week. 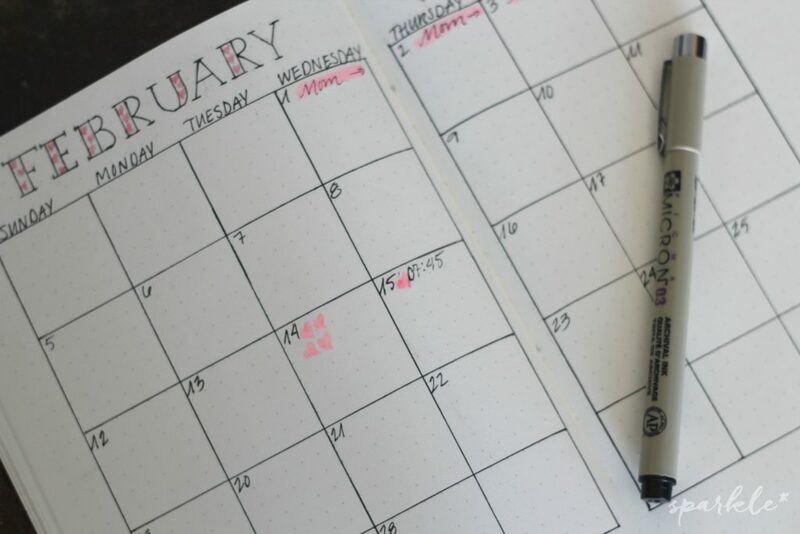 So far, I have made the monthly calendar for January and February, a weekly schedule for January and I’ve started a list of attainable goals for this year. Obviously I need to work on my goals. I’ve been really focused on having less stuff, and that goal above is my biggest one this year. More on that another time! I’m so eager to more make lists and plans in this bullet journal. 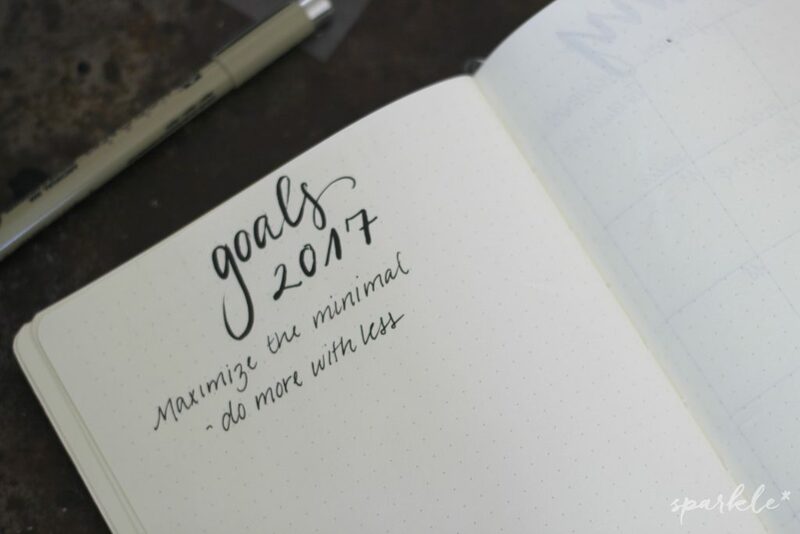 What ideas do you have for a bullet journal and planner? Linked to these fantabulous parties! I love bullet journaling. I started back in the fall and it has changed my life. Bullet journaling is so much fun. I set out to make one a couple of years ago, but I never kept up with it! Hi Jessa! Bullet journaling looks like something you need time for… Plus I am a bit lazy too… But it works for you and many others! Thanks for sharing at Dishing It & Digging It! I look forward to seeing more of your creativity this year! I love your week layout! I started bullet journeling this year after about 2 months in a test journel. I love it and have been the most productive in a long while using it! 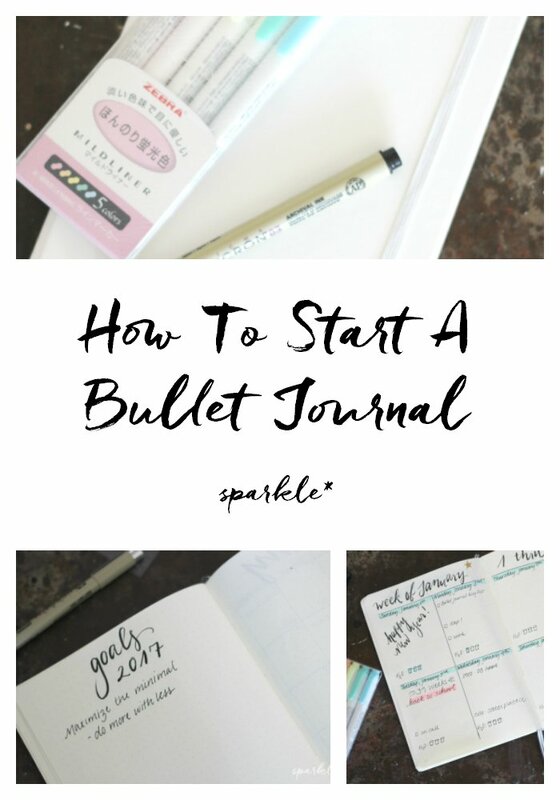 Thanks for sharing your bullet journal ideas at the #HomeMattersParty last week. Hope you will link up with us again at this Friday’s party. I can’t live without my Google calendar. My phone is always with me.